This is a very brief post, in-between computer crashes. As the Wehrmacht Awards forum’s Jerry B (Bond) and so many others noted, the image of the Nazi War Diggers ‘trying to look like big game hunters with the spoils of the hunt was in incredibly bad taste‘. 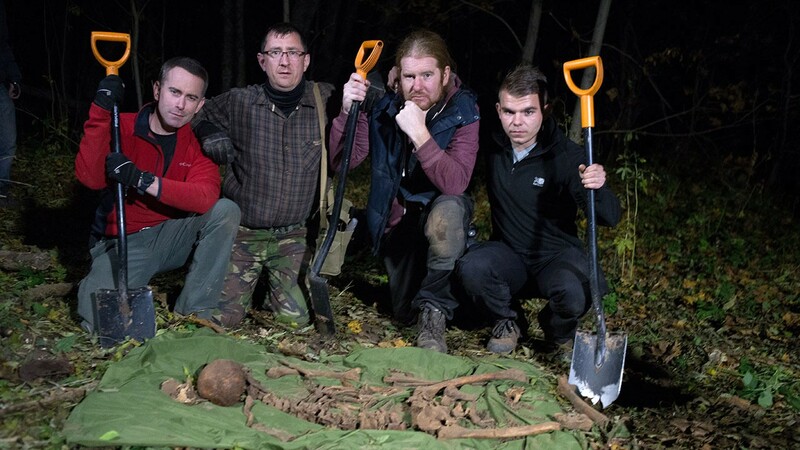 In an official photograph from the production, the team are shown crouching behind an array of human bones laid out on a groundsheet, with only the fact that they are holding shovels rather than rifles distinguishing them from big game hunters posing with their prey. But I’ve been teaching at the American University of Rome while #NaziWarDiggers has been barely rebranded as #BattlefieldRecovery and broadcast in the UK. And, while I’ve been away, I’ve been reminded of and haunted by an even more grotesque episode of commodity-driven digging in Poland, where the third episode of “Battlefield Recovery” was filmed. 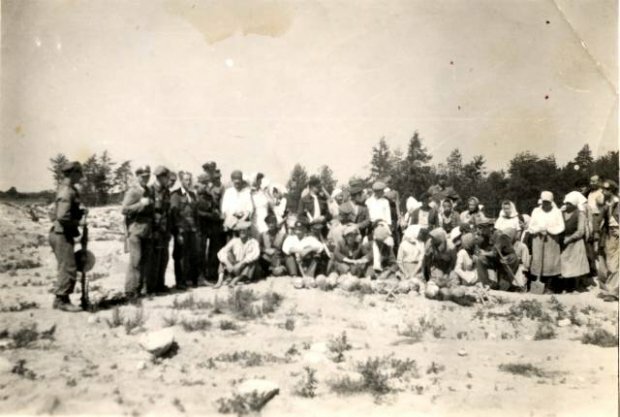 The second photograph was taken by participants in the “gold rush at Treblinka (Gorączka złota w Treblince)”. The line of things in front of the crowd are the skulls and long bones of Holocaust victims, which have been arranged by the crowd for the occasion (with the Jewish bones in Christian crosses), as they have arranged themselves around the human remains to record the moment for posterity. It was first published by Marcin Kowalskiego and Piotr Głuchowskiego in Gazeta Wyborcza on the 8th of January 2008. It is the dark driver behind Jan Tomasz Gross and Irena Grudzińska Gross’s book on the Golden Harvest: Events at the Periphery of the Holocaust. The book focuses on the plunder of “post-Jewish” property by “diggers (kopacze)” or “gleaners (kłosarka)”, who exhumed the mass graves and pillaged the extermination camps of Treblinka, Sobibór, Majdanek, Chełmno, Bełżec and Auschwitz-Birkenau (which continued long after the war, and has happened again more recently in some places, for example at Sobibór). It also looks at “blackmailers (schmaltzowniki)”, who extorted Jews in hiding from deportation to death camps, and local civilians who participated in “hunts for Jews (Judenjagd)” throughout Nazi-occupied territory. That history deserves to be discussed in its own right, but the reason that the book has stuck in my mind is that the photograph and other testimony starkly impress how normal, socially acceptable, socially expected it was. It was so socially expected that some people who did not extort the victims of the Holocaust did not want that to be known for as long as they lived. Have you seen this blog? “Grave digger voyeurism”. Says it all.